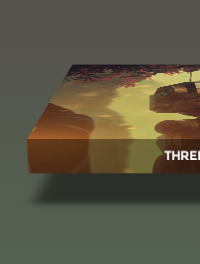 The bottom surface of the cuboid is made using a pseudo element which inherits the background image of the thumbnail and is positioned perpendicularly to create the 3D box effect. The second pseudo element uses a translucent background and box-shadow to create a blurred dark shadow for the cuboid. Though CSS blur filter provides better control and visuals for the shadow, we stick to box-shadow because of the lack of support for CSS filters in many browsers. this doesn’t work… please someone help me..
Wow, really impressive. Thanks for sharing. Thanks for the wonderful tutorial..
am a beginner at css… was wondering if i want this effect on multiple images at the same time… where do i place the images??? i have tried this code using notepadd ++ and launching in chrome but its not working, any ideas why? Your example here works fine in Chrome, but when copied to a test html, the 3D effect does not work at all. In Firefox the test HTML does work though, which is odd… As expected IE didn’t work at all..
@Henk, in Chrome you need to add the -webkit-* expecific tags to css. why doesn’t it work with Safari? can u tell me how to change this in other way. From small picture get this one u get now. Really good work! I’ve tried to make this responsive, but can’t find a way to deal with the height of the thumb div. If I make the height a percentage instead of fixed pixel value it won’t work anymore. Any idea how to make it work with % instead of px values? is usually an excellent choice. Let’s score a lie at whatever of the loved indoor girls’ toy. Rarest nerf gun Parents should create rich environment with toys in the home for baby, focus on perception characteristics of toys like size, colors, and shapes.